Despite Republicans’ long standing campaign of boning up relationships in the Asian community–it turns out, Asians as a voting bloc lean to the left. This is significant for many reasons and brings up a lot of questions, like why? Well, the reasons are probably varied and nuanced, but what we can say is this–it is statistically significant and the right can’t ignore it (or use us as pawns in their PR campaigns about faux-versity). Jamelle Bouie points out at the American Prospect–Asians are left out of the conversation on immigration, yet immigrate at a higher rate than Latinos. 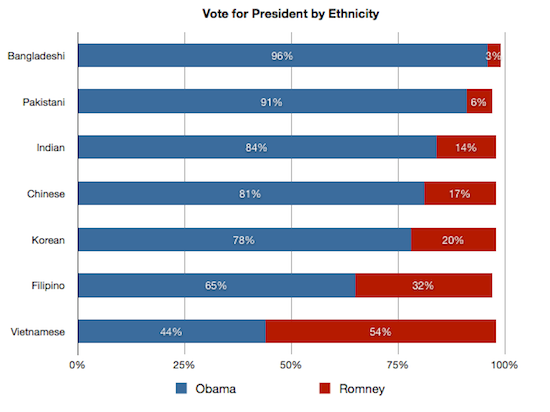 And he made a chart showing the shift in support towards Obama. When it comes to dating, fetishization is often confused with sexual preference. “What you like,” when it comes to dating, seems to be one of the most visible and untarnished sites of race based assumptions about the sexual prowess of your potential sexual or relationship mate. In short, it is totally acceptable for a man to say that he prefers Asian women because in their eyes, Asian women have certain innate characteristics. I recently discovered that this particular obsession with Asian women (especially on behalf of white men) is called “yellow fever.” Charming, really.